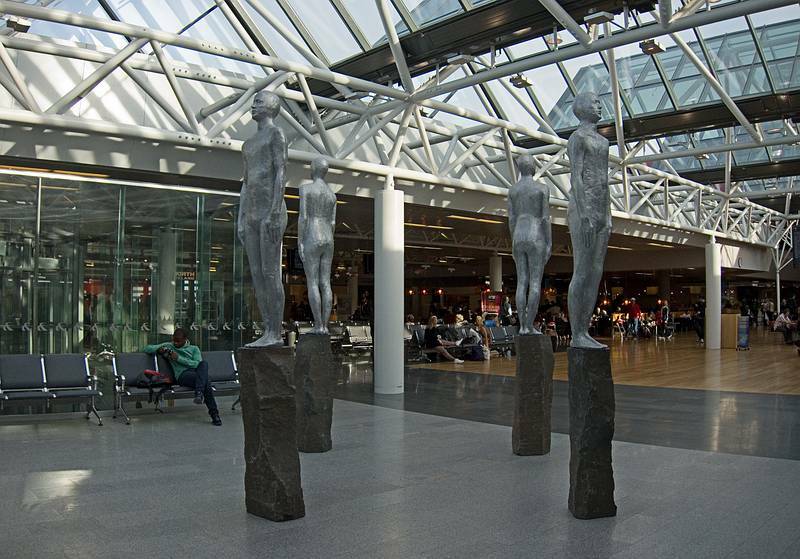 En route to a two week trip around Latvia, during a layover at Keflavik airport in Iceland, I experienced Directions, a sculpture installation by Steinunn Thorarinsdottir. Four life casts in aluminum are mounted on columns of basalt, a hard volcanic stone common to this seismic island. The figures face outward, toward the four compass points and therefore the ends of the earth, like explorers awaiting their voyages. The artist’s choice of material may seem alien, since there are no veins of metal to be mined here in this geologically new land. However, the American aluminum industry has been a contributor to the economy for some time, importing the raw materials and converting these at their factories through the use of Iceland’s ample earth energies. This benefits the economy of Iceland in many periferal ways, giving the artist’s selected media added meaning. Her use of aluminum imparts a significant social statement. Iceland Air showed a documentary about the making of Directions and Thorarinsdottir’s process as one of the in-flight offerings, which in itself made a statement about the importance of contemporary art to this small country of only 300,000 residents. Although Thorarinsdottir’s cast metal figures immediately remind one of Antony Gormley‘s iron self-casts standing sentinel over coastlines, bays, (Another Place), and staring into museum entrances (Reflection II at the DeCordova Museum in Lincoln,MA), the brightness of her aluminum and her neutering of these figures give them a lighter, more ethereal character. Are they human or huldufolk? Allegories for the cardinal points or mechanized indicators of the human impulse to roam? The media itself and her refinements of the figures make these her own. This entry was posted in Norse, reviews, sculpture and tagged contemporary art, public sculpture, sculpture. Bookmark the permalink. Post a comment or leave a trackback: Trackback URL.